Guess who is the happiest of all, with the construction of the sanitation units coming up in Vadia?? The children from Vadia who are studying in various hostels run by VSSM are the most delighted lot with the construction of sanitation blocks in their homes. A large number of Vadia children are acquiring education through various education initiatives of VSSM. These children are staying with the VSSM run hostels. One of these days Chadra, a boy from Vadia and studying in Ahmedabad visited VSSM’s office in Ahmedabad. “The work VSSM does in Vadia is remarkable but this is the best thing to have happened!!! Every time we returned for our vacations it was a challenge to stay without toilets, many a times we did not like coming home because of absence of toilets. A big Thank you for thinking about us …” his words were music to our ears!!! Isn’t this what education is all about and the change it is supposed to bring. We are extremely grateful to Deepakbhai Choudhary for taking up the task and working under the extremely challenging circumstances Vadia offers. He has ensured that work progresses as scheduled and maintains the quality that is required. Deepakbhai and his team have succeeded in the task they had taken up… A big thank you from all of us at VSSM. વાડીયામાં સેનિટેશન યુનિટ બનાવવાનું કામ હાલમાં ચાલી રહ્યું છે. ગામનાં લોકો તો એનાથી ખુશ છે પણ સૌથી વધારે ખુશ આ ગામના અને vssm ની મદદથી વિવિધ હોસ્ટેલમાં ભણતા વિદ્યાર્થીઓ છે. તા.૧૮ જાન્યુઆરીના રોજ ઓફિસમાં આ ગામનો અને અમદાવાદમાં ભણતો ચંદ્ર મળવા આવ્યો. એણે કહ્યું, ‘વાડીયામાં ઘણા સારા કામ vssm દ્વારા થયા છે પણ આ કામ અમારા માટે ઉત્તમ થયું. ગામમાં વેકેશનમાં કે પ્રસંગોપાત જવાનું થાય ત્યારે સેનિટેશન યુનિટ ના હોવાના કારણે ખુબ તકલીફ પડતી ક્યારેક તો ગામમાં જવાનું મન જ ના થાય એમ પણ થાય. તમે ચિંતા કરી એ માટે THANKS’ કેવી સરસ લાગણી. Vadia and its residents have always been an enigma for the society. For many decades the women of Vadia have practiced prostitution as a means to earn their living and fend their families. While the society held their prejudice and believed that it was a profession these women choose voluntarily, the fact was totally contradictory to it. As a result of such mindset across sections of society no government agencies, voluntary organisations or individuals succeeded with their efforts in Vadia. In 2005-06, we reached Vadia with an objective to make basic infrastrucutre facilities available to its residents. There was no pucca road connecting Vadia to the nearest village nor were the facilities of power, water, housing or sanitation available to them. When we brought these issues to the notice of the authorities they always argued “that there was no need to work in this village and with this community! !” Even the school never functioned as the teacher hardly showed up, as they considered Vadia to be their punishment posting. Such preconceived behaviour hindered the community’s chances of accessing even the basic human rights…. As mentioned Vadia has been mysterious, more so because of the facade it wears, the need of it is because of its extreme vulnerability. To guard their vulnerability the community here maintains a very uptight appearance. They do not allow people to get close to them and neither they share their pain and sorrows with others. The initial years remained extremely challenging for us, we had to prove to this community that our presence in the village was to support them and not take advantage of their vulnerability. The stand VSSM took was to be a friend of these families instead of preaching them to shun away the profession they practiced. How can we even do that when we had no alternate livelihood available!! And why even bother of what others are doing or saying, we had the intention to remain patient, understanding and calm……..This preparedness helped us find a footing in a village where people never liked to visit again. The community members began approaching VSSM for their issues, shared their pain and joy with us, opened their hearts to us, made us part of their lives; basically they put faith in us.. They shared numerous stories with us, tales enough to write a novel…Our patience paid because we had no malice in mind our intent was to be helpful to them as much as possible……. Our presence in the village and the never-say-die attitude helped us bridge the gap with the Vadia community. To an extent this also sensitised the authorities who mellowed a bit and changed their stance towards Vadia. A pucca road and decent pucca houses in the village became a reality, the water issue eased a bit. VSSM began a school in the village… and many more such encouraging outcomes were witnessed. 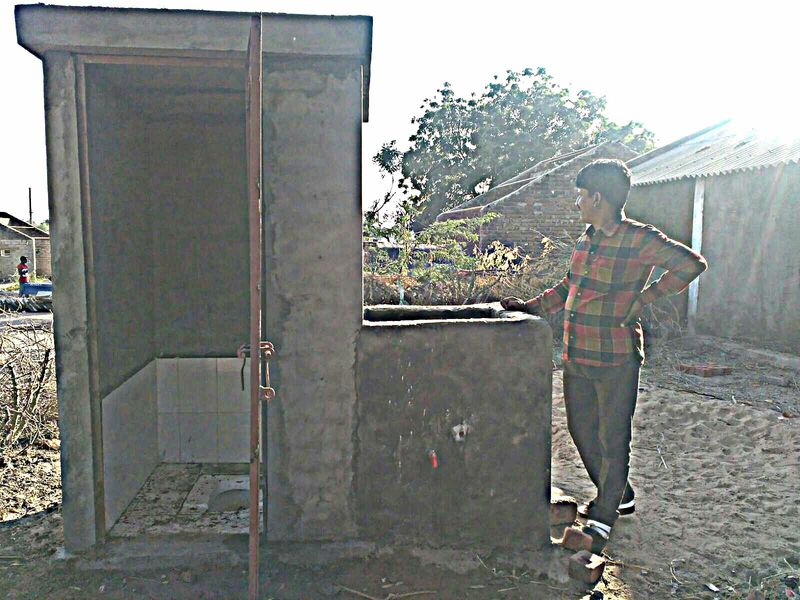 The community needed sanitation units and has been requesting for the same for quite some time now. 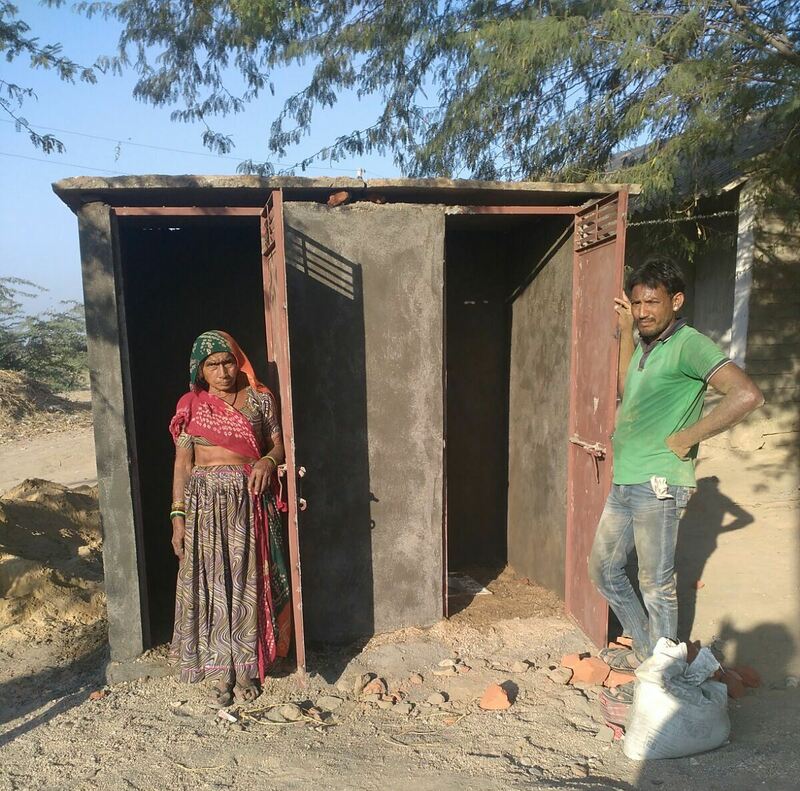 The government aid only comes after the sanitation unit is built, a photo clicked and sent to the concerned department, who laters reimburses the amount spent on building the unit. It is impossible for the community here to save so much of cash on hand (around Rs. 12,000 to 15,000) to construct a toilet block!! The other pre-condition to access government support was the unit had to be in the village whereas there are numerous families who stay in farms and could not access government aid. Hence, VSSM requested its well-wishers to contribute towards construction of sanitation units in Vadia. In the first stage we have decided to construct 60 units from the support we have received so far. The Block Development Officer (BDO) has inspected the ongoing construction,as this point, we aren’t sure how many families will receive the government support but the community has agreed to give the amount they receive to the families staying in the farms who aren’t entitled to any such government support. Such gesture might seem normal but considering the image Vadia had, its pure magic!!! Government support APL families is Rs. 8000 whereas to the BPL families is 12,000. 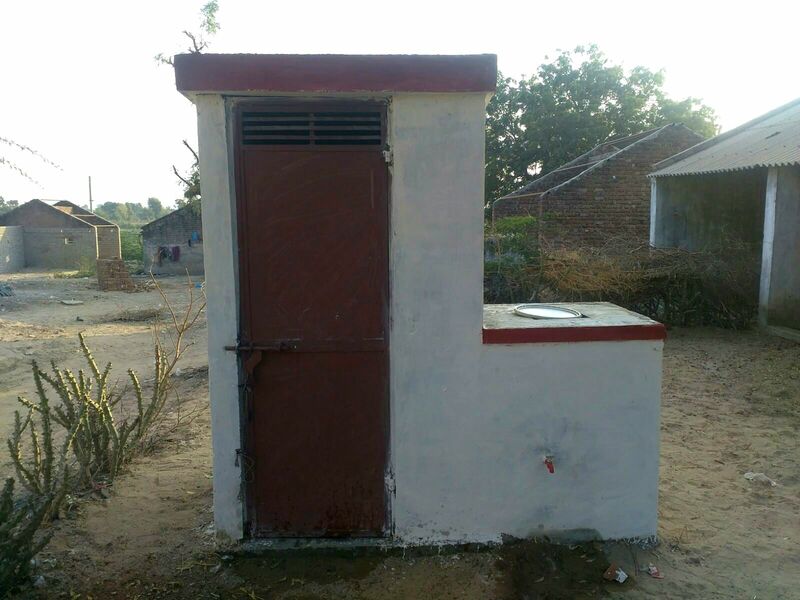 The cost of constructing one sanitation unit is Rs. 15,000. The remaining amount will be provided by VSSM, whereas VSSM will cover the complete cost for the families who aren’t entitled to government support. We are extremely grateful to all our supporters for responding to our call and extending generous support. We are also thankful to Shri Deepakbhai Chaudhry for taking charge of the construction of sanitations units in Vadia. It would have been challenging task for VSSM to ensure completion of the project considering the internal dynamics prevalent in Vadia. વાડિયામાં સેનિટેશન યુનિટનું કામ શરુ થયું. બનાસકાંઠાના વાડિયાગામમાં ૨૦૦૫-૦૬ ના વર્ષમાં વારંવાર જવાનું થયું. મૂળ તો આ ગામમાં તમામ પ્રાથમિક સુવિધાઓ ઉપબ્ધ થાય એ કરવું હતું. એ વખતે તો વડગામડાથી વાડિયાને જોડતો પાકો રોડ, પાણી, લાઈટ, ઘર જેવી કોઈ સુવિધા આ ગામના લોકોને મળી નહોતી. આ સંદર્ભે કચેરીમાં રજૂઆત માટે જવાનું થાય એટલે સૌને આ ગામમાં કોઈ કામ કરવાની જરૂર નથી એમ જ લાગતું. વાડીયામાં રહેતાં સરાણિયા પરિવારોની બહેનો દેહવ્યાપાર કરીને પરિવારનો ગુજારો કરતી જે સામાન્ય સમાજ માટે સરળતાથી સ્વીકારી શકાય એમ નહોતું, વાત ખરી, પણ અન્ય વિકલ્પ માટે કે એમને આવી દોઝખભરી જિંદગી કેમ અપનાવવી પડી એના મૂળમાં જઈ આ સમસ્યાને સમજવા કોઈ તૈયાર નહોતું. ગામમાં જવાનું કહેવામાં આવે એટલે સૌના નાકના ટેરવાં ચડી જાય. જે શિક્ષકની આ ગામમાં બદલી થાય એને સજા મળ્યા જેવું લાગે. શરૂઆતના એ દિવસો ખુબ સંઘર્ષમય રહ્યાં. પણ ધીરજથી કામ કરવાનું હતું એ અમે જાણતા હતાં. વળી એક અભિગમ એ પણ હતો કે, કોઈ શું કરે છે? એની પળોજણમાં પડ્યા વગર આપણાથી શું થઇ શકે એ વિચારીએ અને એ દિશામાં કામ કરીએ તો વધારે સારું થઇ શકે. બસ આ અભિગમે ગામમાં ધીમે ધીમે બદલાવની શરૂઆત કરી. આ ગામના કેટલાય રહસ્યો જે કયારેય કોઈ જાણી ના શકે એ રહસ્યો સરણીયા પરિવારોએ સામેથી કહ્યા. આ બધું એમના પરિવારના સભ્ય કે સ્વજન બન્યા વગર સંભવ નહોતું. પણ ભાવ શુદ્ધ હતો એટલે ધીમે ધીમે લોકો ભરોષો મુકતા થયા અને મુક્ત મને પોતાની આપવીતી કહેતા થયા. એક નહિ પણ અનેક નવલકથા રચાય એવી આ ગામમાં રહેતાં દરેક પરિવારની વિટંબણા હતી. સતત લાગ્યાં રહેવાનાં કારણે વહીવટીતંત્રનો અભિગમ પણ ધીમે ધીમે બદલાયો. રોડ અને પાકા ઘરો બન્યાં. પાણીની સમસ્યા પણ કંઇક અંશે હળવી થઈ. ગામમાં શૌચાલય બને એ માટે ગામલોકો ઘણા સમયથી રજૂઆત કરતાં હતાં. પણ ગામડાંમાં શૌચાલય માટે સરકારી સહાય શૌચાલય બનાવ્યા પછી એનો ફોટો પાડી કચેરીમાં આપ્યાં પછી મળે એમ અધિકારી વારંવાર કહે. જયારે બીજી બાજુ વાડિયામાં રહેતાં એવાં કેટલાંય પરિવારો પાસે રૂ.૧૨,૦૦૦ થી રૂ.૧૫૦૦૦ની એવી કોઈ જમા પુંજી નહોતી કે જેમાંથી એ સેનિટેશન યુનિટ બનાવી શકે. વળી ગામમાં જેમની પાસે સનદ હતી એમને સેનિટેશન યુનિટ બન્યા પછી સરકારી સહાય મળે પણ ખરા પણ જેમના ઘરો ખેતરમાં હતાં એમને આ સહાય મળવાનું સંભવ નહોતું. આખરે vssmએ વિચરતી જાતિના કામોમાં મદદરૂપ થતાં સૌ સ્વજનો સામે અપીલ મૂકી અને આ નિમિતના પૈસા મળ્યાં. અમે ૬૦ પરિવારના સેનિટેશન યુનિટ પ્રથમ બનાવવાનું નક્કી કર્યું અને એનું કામ શરુ થયું. તાલુકા વિકાસ અધિકારીને ગામમાં સેનિટેશન યુનીટનું બાંધકામ શરુ થયાનો ખ્યાલ આવ્યો એટલે એ આવીને બાંધકામ જોઈ ગયાં. એ કેટલાં પરિવારોને સહાયની રકમ આપે છે એનો ખ્યાલ નથી પણ જેમને મળશે એ તમામ પરિવારો એ રકમ જેમને સરકારી ગ્રાન્ટ ખેતરમાં ઘર હોવાના કારણે નહિ મળી શકે એમને આપવાનો નિર્ધાર કર્યો છે. આમ તો આવો વિચાર પણ આ ગામના ભૂતકાળના અનુભવો યાદ કરું તો આશ્ચર્ય થાય એમ છે. પણ ચમત્કાર થાય છે એ અમે માનીએ છીએ અને અમને એ વડિયામાં દેખાય છે. સરકાર BPL લાભાર્થીને રૂ.૧૨૦૦૦ અને APL પરિવારોને રૂ.૮,૦૦૦ મદદ કરે છે જયારે એક સેનિટેશન યુનિટની કોસ્ટ રૂ. ૧૫,૫૦૦ જેટલી થાય આમ બાકીની રકમ vssmમાંથી આપવામાં આવશે. અને જેમને સરકારી સહાય નહિ મળે એમનો તો તમામ ખર્ચ vssm આપશે. આ કામ vssm સાથે સંકળાયેલા સૌ દાતાઓની મદદથી સંભવિત બન્યું જે માટે અમે સૌના આભારી છીએ. સેનિટેશન યુનિટનું બાંધકામ વાડિયામાં કરવાનું હોઈ લોકલ માણસોનું કામ માટે મળવાનું થોડું મુશ્કેલ બનત. વળી આ દિશામાં સંસ્થાગત રીતે અમારો કોઈ અનુભવ પણ નહિ ત્યારે આ ક્ષેત્રમાં ઘણું કામ કરતાં શ્રી દીપકભાઈ ચૌધરીએ આ સંદર્ભનો તમામ ભાર ઉપાડી લીધો જે માટે અમે સૌ એમનાં આભારી છીએ. Rupabhai and his family a sarania family reside in Vadia. The family has been allocated 3 acres of land, a portion from the government allotted land to the Vadia Women Cooperative society. Vadia being a dry and arid region government also made irrigation facility available for the residents of Vadia willing to take up farming. However one bore well isn’t enough to supply water to all the farmers. Hence Rupabhai takes water from the farmers who have bore wells on their farms. 3 acres as such is very small piece of land and returns on farming parent enough to sustain the family. Rupabhai felt that compared to agriculture cattle farming is a more viable option. He requested VSSM for an interest free loan of Rs. 50,000 to buy buffaloes. VSSM stationed his loan and Rupabhai has bought a buffalo from the money. Rupabhai now grows fodder on his land and sells the milk from his buffalo in Vadia. He also remains regular in paying back the instalments to VSSM. “Be extremely careful, do not carry any extra money or wear any jewellery when you go to Vadia, people there will loot you!” is how everyone had warned me when I planned my first visit to Vadia in the year 2005. When I witness such honesty from the community in Vadia it really makes me wonder why and how such perceptions are formed to stigmatise a particular community. Rupabhai and many like him are honestly doing their jobs and returning back the money borrowed from VSSM. No on is bad, its the circumstances that make shape their behaviour. The community in Vadia need warmth and care and change automatically comes through. Its this miracle we are witnessing right now in Vadia. The journey of restoring the dignity of families of Vadia has been extremely difficult and emotional we are thankful to Shri. Rameshbhai Kcholiya, Shri. Nimesh Sumti, Shri. Pradipbhai Shah, Shri. Rashminbhai Sanghvi and friends of VSSM for standing by us and providing us the support to keep going. રૂપાભાઇ વાડિયાગામમાં રહે. ગામની બહેનોને મળેલી સામુહિક ખેતીની મંડળીની જમીનમાંથી ૩ એકર જમીન રૂપાભાઇના પરિવારને મળેલી એટલે એ જમીન ખેડે. ગામમાં સિંચાઈનો એક બોરવેલ છે પણ એનાથી આખા ગામની ખેતીની જમીન પિયત થતી નથી. બાજુના ગામના ખેડૂતોની જમીનમાં બોરવેલ છે. તેમની પાસેથી પાણી માંગીને રૂપાભાઇ ખેતી કરે. ખેતીની જમીન ખુબ ઓછી છે. જો ખેતી સાથે પશુપાલન કરે તો ઘણો ફાયદો થાય એવી રૂપાભાઇની લાગણી. વાડિયાગામમાં રહેતાં અને પોતાનો સ્વતંત્ર વ્યવસાય કરવા ઇચ્છતા પરિવારોને vssm વગર વ્યાજે લોન આપે છે. રૂપાભાઇએ ભેંસ ખરીદવા રૂ.૫૦,૦૦૦ની લોન આપવા વિનંતી કરી. રૂ.૫૦,૦૦૦ની લોન મળતાં એ ભેંસ લઇ આવ્યાં. હવે ખેતરમાં તે ભેંસ માટેનો ચારો પણ કરે છે અને દૂધ વાડિયા ગામમાં રહેતાં લોકોને વેચાતું આપે છે. vssmમાંથી લીધેલી લોનના હપ્તા પણ નિયમિત ભરે છે. વાડીયાના પરિવારોને બેઠા કરવા સ્વમાનભેર જીવતાં કરવામાં જેમણે પ્રેમપૂર્વક મદદ કરી એવા શ્રી રમેશ કચોલીયા, શ્રી નિમેશ સુમતિ, શ્રી પ્રદીપભાઈ શાહ, શ્રી રશ્મીન સંઘવી અને ફ્રેન્ડ્સ ઓડ vssm સૌનો ખુબ ખુબ આભાર..
વાડીયામાં તળાવ ઊંડું કરવાનું કામ શરુ થયું..
બનાસકાંઠાના વાડીયાના લોકોને ખેતીલાયક ૨૦૮ એકર જમીન સરકારે ૧૯૬૩માં આપી. (પણ સરકારે આપેલી બધી જમીન પર સરાણીયા પરિવારોનો કબજો નથી. કેટલીક જમીન પર શરૂઆતથી જ દબાણ છે) આ પરિવારો જમીન પર ખેતી કરી શકે એ માટે સિંચાઈની સુવિધા સરકારે વખતો વખત કરી પણ સુકો પ્રદેશ અને વરસાદ પણ પ્રમાણમાં ઠીક ઠીક અને બોરવેલની માવજત બહુ આવડી નહી એટલે બધું નકામુ થઇ પડ્યું. ક્યાંક કુદરતે પણ ભૂકંપ રૂપે નુકશાન કર્યું. ૨૦૦૮માં એક બોરવેલ સરકાર અને vssmની મદદથી શરુ થયો પણ જમીનને પાણીની જરૂરિયાત પૂરી પાડવા માટે બોરવેલ સક્ષમ નહિ. બીજા બોરવેલની આપણે માંગણી કરી છે. આશા છે એ કનેક્શન મળે પણ ત્યાં સુધી હાથ પર હાથ ધરીને બેસી રહેવા કરતા ગામમાં તળાવ નથી પણ મોટો ખાડો છે એને ઊંડો કરીને આખા ગામનું ચોમાસાનું પાણી એ ખાડામાં ભરાય એનું આયોજન કરાય તો ખાડામાં ભરાનાર પાણી ખેતીમાં ઉપયોગી થાય. આ માટે મુંબઈથી શ્રી રશ્મિનભાઈ સંઘવીએ ટેકનીક મદદ કરી આમ તો આ આખો વિચાર એમણે જ સુઝાડ્યો એમ કહીએ તો ચાલે. શ્રી રમેશભાઈ કચોલીયાએ ખાડો ઊંડો કરવા આર્થિક મદદ કરી અને ખાડો થોડો પહોળો અને ઊંડો કરવાનું શરુ કર્યું. ફોટોમાં તળાવને ઊંડું કરવાનું કામ ચાલતું જોઈ શકાય છે. 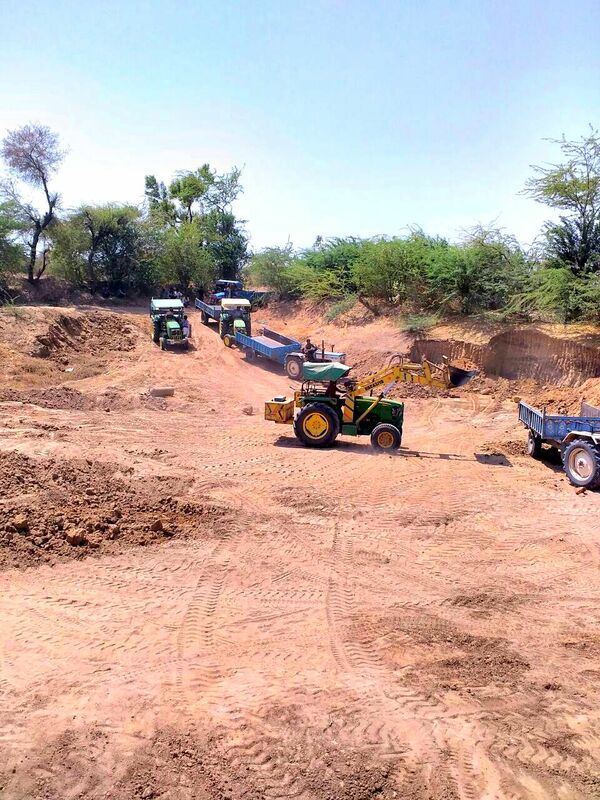 Vadia now has a “pothole turned lake” to conserve rain water ….. In the year 1963, as a measure to rehabilitate and provide alternate livelihood opportunities, the government allotted 208 acres of land to the families of Vadia (Not all land is owned by the families. Some land has been encroached from the beginning). As Vadia is a drought prone and arid region the government had also created irrigation facilities by installing two bore-wells. But the neglect in maintaining the bore-well damaged it badly and the second bore-well had became dysfunctional as a result of land slide during the 2001 earthquake. In 2008 Vicharta Samuday Samarthan Manch -VSSM and government together repaired it but a single bore-well proved insufficient to meet each farm’s irrigation need. We have requested the government for approving installation of another bore-well but that is going to take time. In the mean time we decided to reduce the community’s dependence on ground water and start harvesting the rain water. Although the region receives very little rain, saving whatever water falls from the sky is wiser choice. The village does not have any lake or other traditional water conservation bodies but it does have a large pot-hole in which during monsoons the water gets accumulated. After receiving the necessary technical guidance from Shri. Rashminbhai Sanghvi, who also sowed the idea of rainwater harvesting in Vadia, we decided to go ahead and deepen the pot-hole, allow the water to get collected in it and later use the conserved water for agriculture. The work to widen and deepen the pothole has commenced. The required financial support for the works is been aided by Shri. Rameshbhai Kacholiya. 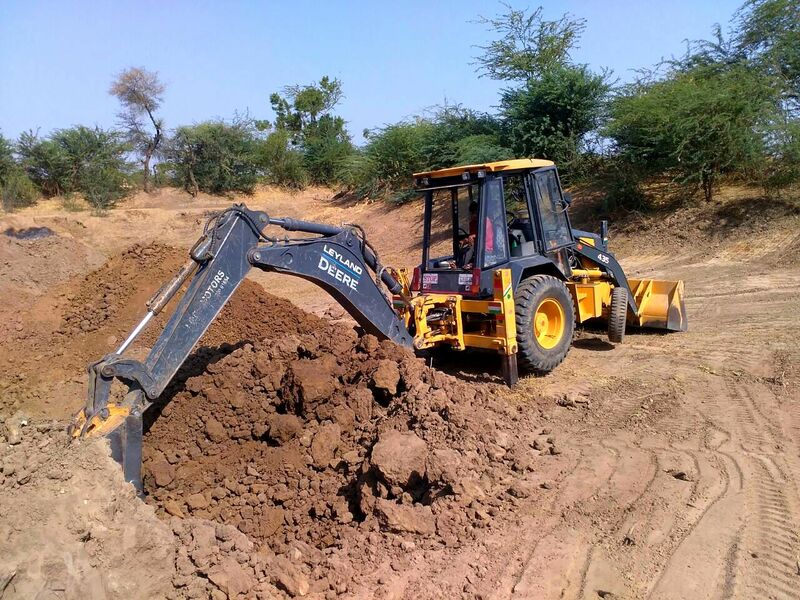 A few days back I received a phone call from the villagers saying, “Ben, the pothole looks more like a lake now, if the monsoon is good we will be able to conserve water enough to take one crop.” Such delightful news are always music to our ears……. In the picture.. work of deepening the pothole in progress. 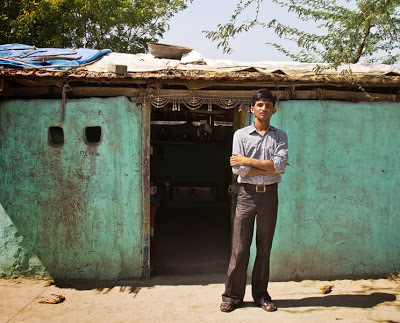 CHANDRA – though his name means Moon, he shines through like a Sun, spreading rays of hope in his Saraniya community…. A Success Story of Right To Education for Saraniya Community boy Chandra with VSSM at VAdiya. The harsh realities and vagaries of life makes children of Vadia way more mature than their age. In the year we began working in Vadia life was absolutely in shatters for these community. The community here had zero access to any of the infrastructural facilities. The village school remained close most of the times. The teachers considered their transfer in Vadia as punishment posting hence hardly reported on duty. The parents were least bothered for the education of their kids. We felt that it was important to bring children out of the environment they were growing up in therefore in 2007-08 we enrolled 40 children in various residential institutes and ashram shalas across Gujarat. But most of the kids came back within few months of enrolment. The children faced discrimination at these institutes. There were some organisations who refused to enrol these children cause they feared that Vadia kids will spoil the hostel environment. A boy named Chandra somehow managed to stay put and continued with his elementary schooling in Yoganjali Ashram at Siddhpur while completed his higher secondary school at Swaminarayan Gurukul in Siddhpur. Later he went on to acquire admission in B.B.A course. After the completion of graduation he plans to pursue his PG from some reputed college. He looks forward to completing MBA and has already began preparations for the same. We are thankful to our constant supporter Shri. Ujamshibhai Khandla of Monarch Builders for supporting Chandra’s education.